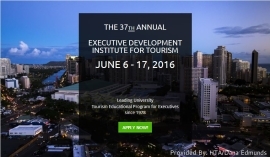 The PATA Foundation is offering two Scholarships for the 2019 session of the Executive Development Institute for Tourism (EDIT) programme. Applications for the 2019 PATA Foundation EDIT Scholarship are now open. This coming year the PATA Foundation will provide one full scholarship, valued at US$3,395, and one partial scholarship valued at US$1,605, for two worthy participants. This scholarship covers tuition fees only. To be eligible to apply for either of the above mentioned scholarships, the requesting organisation must be a PATA International member in good standing, and the proposed candidate should hold an executive position. Please note that the candidate and/or the candidate’s employer or sponsor must bear the balance of the tuition costs, expenses for travel to and from Hawai’i, hotel accommodation and other programme-related expenses that are not covered by the respective scholarships. Please pass on this information to prospective applicants for their assessment. February 1, 2019. Incomplete applications will not be accepted. Successful candidates will be notified by email by February 16, 2019. The decision to grant either full or partial scholarships is at the discretion of the selection committee. For information about the PATA Foundation scholarships, please contact info@PATAFoundation.org. 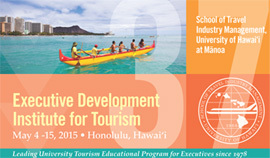 To enquire about specifics of the EDIT programme, please contact the TIM school Director, Ms. Rachel Kaiama at rsoma@hawaii.edu. 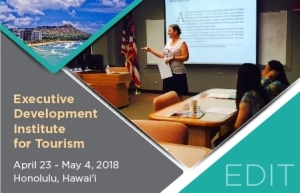 This programme provides an exceptional development opportunity for industry executives, offering real benefits that make a substantial contribution to leadership growth across the travel and tourism industry. This is a fantastic opportunity to meet and study with representatives from across our industry and the Asia Pacific region. We encourage you to consider the value and benefits of these scholarships and we look forward to receiving applications from your organisation. The PATA Foundation is offering four (4) sponsorships to member-endorsed candidates to attend the 2018 Hong Kong PolyU Winter School. 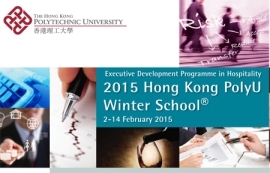 This is the Executive Development Programme in Hospitality, taking place in Hong Kong from December 3-15, 2018. 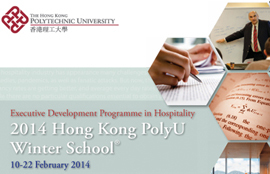 The Programme is developed by the Hong Kong Polytechnic University’s School of Hotel & Tourism Management, and co-organised by the Hong Kong Hotels Association and Institute for Entrepreneurship at the Hong Kong Polytechnic University. Sponsorship will cover the registration fee of one module, and three nights’ accommodation (inclusive of breakfast) at Harbour Plaza Metropolis Hotel. 3. Other living expenses: meals, ground transportation, insurance, and so on. October 19, 2018. Incomplete applications will not be accepted. Due to circumstances beyond our control, the Programme has been postponed. Accordingly, the PATA Foundation Scholarship Selection Committee has decided, reluctantly, to suspend its deliberations and will not therefore be making an award for 2017. 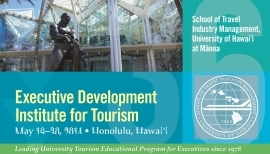 PATA Foundation sponsored Dileep Mudadeniya who works at Sri Lanka Tourism Development Authority to attend this year’s Executive Development Institute for Tourism (EDIT) programme at the University of Hawaii at Manoa in Honolulu, Hawaii on 11-22 July. 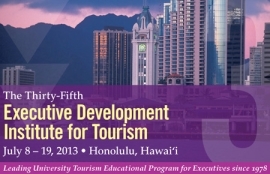 The Foundation scholarship of US$5,000 covers registration/tuition fees and accommodation costs. The Foundation is also grateful to the support of the Jerome A. Keller Memorial Fund in sponsoring a further place at EDIT for Diwakar Bikram Rana, Senior Manager, Tourism Marketing & Promotion at the Nepal Tourism Board. The Foundation would like to express special thanks to Gloria Henderson (middle in picture) for continuing her sponsorship for over 20 years. It has been my pleasure to support the Annual EDIT Program at the UH TIM School by offering the “Jerome A Keller Scholarship Grant” to an applicant from the Asia/Pacific. The recipient is from a PATA member organisation, specialising in Marketing and Public Relations. I have been doing this this for over 20 years, which is my way of giving back to an industry that has been so good to me for the past 37 years. By using the PATA Foundation through education support, I hope to continue my contribution to help those who otherwise could not attend the EDIT Program. Henderson said.